Mumbai is one of the great cities of the world, drawing in film makers so they can use the dense urban landscape as a canvas on to which they can endlessly inscribe dreams, nightmares and anxieties. A microcosm of cosmopolitan and secularist narratives, Mumbai is continually re-presented in the fantasies of Hindi cinema as the gateway to contemporary success or failure. Like New York, the Mumbai milieu was made for cinematic reinterpretation and performance – the geography of the city continues to be contested in the imagery of the media and whilst the urban slum has become a popular frame of reference, it celebrates a metropolis like pluralism that is dignified. Opening with an interior shot of a nondescript taxi making its way curiously through the rain swept streets of Mumbai; Kiran Rao’s directorial debut Dhobi Ghat immediately takes up the first person perspective of the first of four characters, this one is making a home video using a camcorder. As the taxi moves past the overcast Marine drive with the sea gazing back at us in the distance, the vehicle stops and for a brief moment the camera films the excited actions of a group of Mumbai street kids who begin performing for the car as though they were in an Indian film. It is a snapshot of urban reality and repeats a restless rhythm familiar to us, an elliptical momentum that just like the city of Mumbai fragments the new and entombs the old – but this snapshot is just one of many micro stories glimpsed in the episodic art film structure adopted by the film maker. 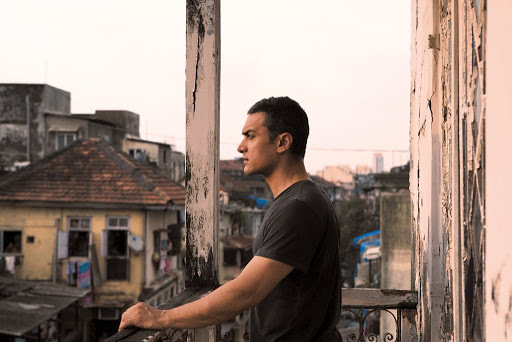 A sincere art house film Dhobi Ghat is typical of Aamir Khan as a producer – uncompromising in its aesthetic agenda, distinctively marketed, economically budgeted, sincerely directed and confidently performed. Inter relating the lives of four characters which deliberately represent the spectrum of contemporary Mumbai, Dhobi Ghat is a discourse on the city and its inhabitants. Played by Aamir Khan, Arun is a reclusive painter who grudgingly appears at the exhibitions of his own work. Somewhat of a womaniser, Arun guards his loneliness as it is the one thing that allows him to be creative. He transforms his pain and the pain of those around him into his work, deconstructing the private video tapes of an unhappy married woman leads Arun to shift from one place to another. A symbol of anonymity, Arun’s identity is in transit, nomadically connected to his refusal to become emotionally involved with anyone who attempts to reach out. Shai (the beautiful Monica Dogra), an investment banker from America who is visiting Mumbai as part of a sabbatical, is also suffering from a similar psychosis of rupture but unlike Arun who is a member of the city, Shai’s outsider status makes her a jaded symbol of the Indian Diaspora. She too is searching for a space from which she can create but her elitist trappings opens a level of discontinuity that prevents her from bridging an all too familiar class divide. A symbol of the authentic Mumbai urban slum, Munna (Prateik Babbar) works as a dhobi washing laundry for the middle class whilst pursuing an outlandish cinematic dream of becoming an actor. Unlike Arun who is an emerging painter and Shai a budding photographer, Munna’s gaze is altogether fixed in a stark reality from which he cannot escape – ideologically both Arun and Shai’s perceptions of reality are filtered through a shared visual gaze that is privileged. The final character, Yasmin (Kriti Malhotra), a newly married Muslim woman, is part of the past, present and future whilst her gaze is hauntingly ubiquitous. Yasmin’s story is conveyed through a series of intimate video diaries that Arun discovers in his apartment – the videos detail Mumbai as a place in which the pain and suffering of women like Yasmin are simply rendered invisible. In many ways, this is a film about conflicting gazes; privileged and unprivileged gazes determined by the economics of the urban city. I plan to see Dhobi Ghat soon, and your sterling endorsement of the film has further accentuated my wish to watch it. I'll come back to your review as soon as I've done that. Thanks Shubhajit, I will probably watch this again for a second time next week just to see how it stands up but my initial reaction was one of surprise – however, some might argue that this is not an art film but in fact a mainstream one parading as an art film. Nevertheless, sometimes trying to position a film in terms of critical debate can overshadow its particular triumphs. The use of Mohammed Ali road in Mumbai which I didn't mention in my review are also important to the feel of the film. On a final note, some critics are saying Aamir Khan is the flaw and a weak link – I would love to know your own response to the film. Thanks. Well, I watched Dhobi Ghat earlier today, and I must confess, I really liked the film. I don't think it is a mainstream film masquerading as an offbeat work. Rather, I found the film a sincere and genuine piece of work… an offbeat film, if you will. And I was also quite impressed with Amir Khan's role in it. He wasn't by any stretch of imagination a star in the film; rather, he was very much the character he portrayed. And his facial expression, when he realised of the predicament of the girl in the video, was one of the moments to look out for, in my humble opinion. And I must mention, your review has done complete justice to this compelling and assured debut film of Kiran Rao. Yes, your right, that is a fantastic moment in the film and really brings together all the different strands. I'm glad you liked it – I hope audiences can make this one a hit, though Aamir Khan apparently has already made a profit on this one which is somewhat encouraging. I think it will likely to appear on end of year lists even though this is a little early to say BUT the problem with films released at the start of the year is that they often end up being forgotten. This entry was posted on January 22, 2011 by Omar Ahmed in Aamir Khan, Art Cinema, Indian CInema, Melodrama, Narrative, Parallel Cinema, Slow Cinema, The City.